What’s Google My Business and how can it help your business? Google My Business is the perfect ally for local stores and businesses that offer services in a specific area. Keep reading to discover how it can help you. Google My Business is a free tool created by Google to help businesses to rank high on the Internet and attract customers. This tool allows physical stores and businesses to stand out on Google searches. These businesses will show up in the first results without even having a website. 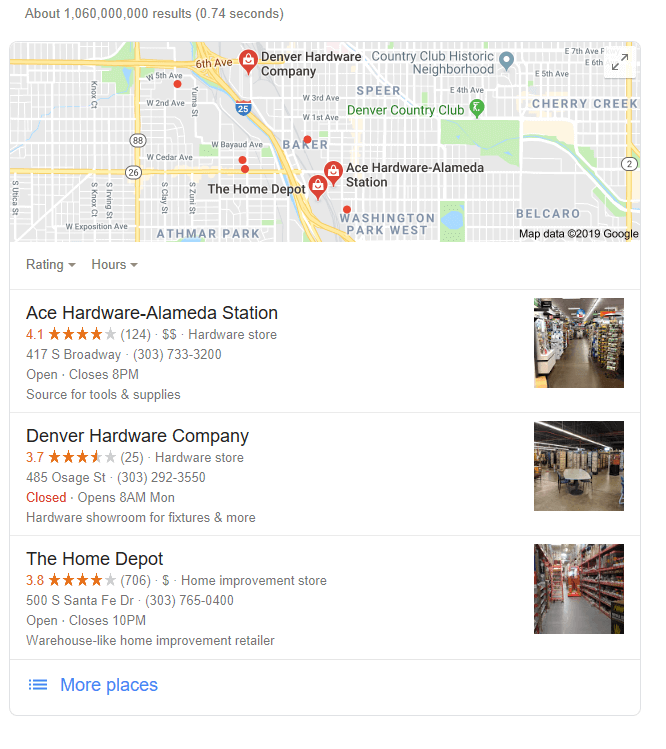 If you are looking for a hardware store, the first thing you will see is the local businesses near you, even before Google’s organic results. If you click more places, all the stores with Google My Business cards situated close by your current location will be displayed with reviews and indications of how to get there. Basically, Google My Business enhances the visibility of local stores and businesses and, assists users in finding what they are looking for in a specific area. ❓ However, … How does Google know which businesses show me? Google knows the geolocation of your mobile phone if you have it activated. On the other hand, if you are searching from a computer, it will know where you are through your searches, your Google account and the IP where you are. If you have a local business or provide a home delivery service, is it worthy to use Google My Business? The answer is a categorical “yes”. Showing up on Google without a website. Being found fast by many potential customers who are searching for the type of services you offer. Appearing on Google twice. Through your card and through your website. Being able to post offers and events that will be displayed to whoever searches your business name. Allowing users to add reviews, images and photos of your business. Now that you know what Google My Business is, we should go deeper and learn how to use it to your advantage. Google My Business helps you manage and organize the visibility of your business on Google. It used to be unthinkable that a small local fashion store could appear on Google above the most popular fashion stores. Now, thanks to the geolocation on searches, it is possible. This means that this tool also helps to improve positioning. So, what can you do with Google My Business? All these possibilities will facilitate the growth of your digital brand and manage your reputation on the Internet. As easy as clicking this URL https://www.google.com/business/ and tap “Manage now”. Then, simply follow the steps provided by Google My Business: Business name, location. business category, etc. If you need some help to create a Google My Business account, you can get more information here.